Conflict of Heroes – Guadalcanal 1942 Review | Armchair General Magazine - We Put YOU in Command! Macready and his boys in L Company didn’t know exactly what to expect as they crept forward through the heavy jungle towards the village of Matanikau. A few days earlier Goettge’s men were ambushed by Imperial Japanese Navel Troops and now the Marines wanted revenge. The jungle heat made even the simplest tasks a burden. At least L Company didn’t have to cross the Matanikau River. Macready could hear rifle and machine gun fire coming from the East – likely B Company was dishing it out to the Japanese but B Company had to get across the river and Macready knew the Japanese weren’t about to let them cross it without a fight. Suddenly, with an earsplitting scream of “Banzai” – a squad of enemy soldiers rushed out around a building in the distance. Macready and his boys readied their rifles – all Hell was about to break loose! Academy Games has followed up their Poland and Eastern Front Conflict of Heroes World War II tactical games with their first foray in to the Pacific. Guadalcanal covers operations between United States Marines and Japanese Imperial Naval Troops in 1942. The box cover features a beautiful and visceral painting by Stephen Paschal. Upon opening the box the player is met with a rule book, a scenario book, several play aids which cover the turn sequence and terrain, charts to track turns, Victory Points, Bushido Points, Command Action Points and Action Points, modular mounted map boards, modular terrain such as rivers, hills and villages, two dice plus some of the most beautiful die cut counters ever seen in a war game. The counters are thick and are easy to both read and pick up (something I didn’t appreciate when I was young but now that I am an older, er… I mean “experienced” gamer, I appreciate large easy to handle and easy to read counters more than ever.) In addition, a counter tray with its own plastic cover keeps the pieces well protected and fits snugly in the box. The rules are logically laid out and easy to learn and feature plenty of designers’ notes and examples. A full index is thoughtfully included. The scenario book features a full history of the Guadalcanal Campaign plus biographical information on some of the more important figures involved in the conflict. 12 different fire fight scenarios are included and cover the major fighting from August 12th, 1942 to October 25th, 1942. The maps are beautiful but the hexes are outlined in black and I find that they are very difficult to make out when jungle terrain artwork is present. I would have preferred the hexes to be outlined in white in order to make them stand out. As it is, I found it difficult to see some hex sides and found reading the hex numbers to be very problematic. Luckily, the scenarios make it fairly easy to see where to put the modular terrain and the units. Conflict of Heroes (CoH) Guadalcanal is very infantry oriented as was the actual campaign so on the American side we have Marine rifle squads, BARs, Raiders, Paramarine Squads, medium and heavy machine guns, mortars, 37mm anti-tank guns and a handful of Stuarts, M3 cannon armed half tracks and landing crafts. On the Japanese side, we have Imperial Japanese infantry, conscripts, light and medium machine guns, grenade launchers, mortars, snipers, 70mm guns, 75 mm guns, 37mm anti-tank guns, Type 97 and Type 95 tanks. The game utilizes the CoH system which if you own other CoH games, makes transitioning to the Pacific a piece of cake. Additional rules for Bushido Points make the player leading the Japanese troops have to adapt to the fighting styles of the Imperial Japanese Military. So you gain benefits and victory points by having your troops take on the enemy in close range or melee combat. In addition, if you are playing the Japanese you can gain victory points and Bushido Points by having your men get killed in brave but deadly Banzai attacks! The actions during a turn are based upon the number of Action Points and Command Action Points each player has. Each unit has a starting action point amount of 7. Any action costs Action Points. Moving through clear terrain may cost a unit only one Action Point but moving through dense jungle may cost up to three. Attacking may cost a unit three or more Action Points. By having the players alternate their turns after taking an action with one unit, the system keeps the players’ attention from drifting away from the game. You have to pay attention each second or you may get destroyed or outflanked and not even realize it until it’s too late. Each counter is rated for action point cost to attack, move, and attack indirectly. Plus each unit is rated for Front Defense, Flank Defense, Attack Rating and Range. The attack rating is further divided in to the rating for soft targets and the rating for armored targets. Other ratings cover the close combat penalty of some units such as machine gun teams or mortar teams, whether a tank has a full 360 degree turret, whether the vehicle is open topped, etc. Additional rules cover night battles, smoke, flares, creating improved positions and group attacks plus much more. For each turn, the players roll for initiative and then take turns activating their units until each unit is out of action points or the team is out of Command Action Points. Command Action Points and Bushido Points (for the Japanese) can help modify die rolls or give units extra actions. To attack, simply look up the unit’s attack rating for the target being attacked, add any modifiers, add any extra pluses for Command Action Points spent or cards used and add this to two die results. If this is equal to or over the target’s modified defense rating, the unit has been hit. The unit which is hit draws a chit from a cup or bag and the result listed on the chit can cause moral issues, units to not fire but cower in place, or even destroy a unit. If a unit gets two hits, it is destroyed. To get ride of moral effects, a unit can try and make a moral roll to rally its self. Different damage chits are included for American troops, Japanese troops and armored vehicles. The American damage chits reflect both the relative inexperience of the American troops but also factors in the high quality of the Marine officers. The Japanese damage chits reflect their confidence, training and willingness to fight to the last man. Consequently, the Japanese have several “No Hit” damage chits which effectively allow some Japanese troops to take up to three hits before being destroyed as a unit. Cards are drawn each turn and may do everything from give a unit a free action to allow you to call fire from off shore navel vessels in order to blast your enemy in to oblivion. That’s really it – the game has only 23 pages of rules which include tons of examples! I taught another gamer to play it in less than 10 minutes. Guadalcanal captures the feel of that horrible campaign. Fights are usually at short range and tend to be brutal melee actions with many casualties. Since the scenarios list the objectives and what happened in real life over 70 years ago, the game is very easily played solo. The drawing of event cards helps to add the element of chance to each game. I can’t get enough of Conflict of Heroes – I find this game system to be one of the best for playing World War 2 tactical battles. While not as detailed as the venerable Squad Leader, it is much more user friendly. The beauty of the components makes Guadalcanal a work of art in itself. ACG reviews now seem to be for board games, for the most part. This has to be an extremely small niche market, doesn’t it? With the computing power of today, who is still taking the massive amount of time to set up and play these games, let alone find opponents(not to mention the destructive power of the family cat). I used to play them in the 80’s, pre-computer. Once the computer became dominant, with companies like Matrix, Battleground, HPS, Gary Grigsby and others providing deep and excellent simulations, I and most others, moved to this mode of play. I can’t imagine the market is very large for board games anymore. Personally, I would appreciate more reviews of the many excellent computer sims available today. It would be more relevant to a larger number of your followers. – I have been shooting prifossoenal since 2008 and I get asked a lot from people to coach/teach them and I feel the same way you did! I want to teach but I feel like I don’t have it all together to preach to someone else how to do it. Got any tips? 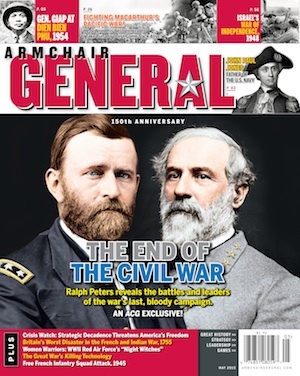 Thank you for visiting Armchair General’s website. While I appreciate your comments, I beg to differ with you. The war board game market has experienced a new golden age and the market has actually increased substantially since the 1980s. The market has had a growth rate of around 18% (some sources quote 20%) for the last five years. In 2015, the average gross sales were in the neighborhood of $880 million. While I agree that computer war games has a large market share, much of that market share is being lost to console and internet device games which have tended to market war games with far simpler scopes. None-the-less, there are some computer war game reviews in the works and you will probably see several in the next month or two. I thoroughly agree with the response. I also must agree with the author of this piece. My primary reason for visiting Armchair General is for board wargame reviews. The number and quality of boardgames is as high at it has been in two decades at least. In fact, I have seen several sites that generally exclusively cover computer games also include some boardgames in their recent coverage.